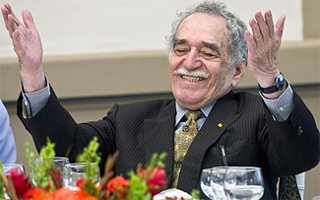 Gabriel Garcia Marquez is hailed as one of the greatest living writers of our times. He received the Nobel Prize for literature n 1982. His Nobel Lecture 'The Solitude of Latin America' provides rich ford for thought. We as Indians find Marquez all the more relevant because he talks about colonialism, erosion of native cultures, mental slavery, loss of pagan ways of living, destruction of self-respect in erstwhile colonial lands mono-culture-ism of today and such related topics. These topics are relevant to the Indian scholar. This is a very powerful lecture by Marquez which shakes our faith in basic tenets of modern civilization. Each word spoken by the author demand repeated pondering. Marquez begins his lecture hitting directly on the nail. He begins with he account of Latin America actually was the description resembles fantasy in today's perception. He simply begins with an implied statement that this fantasy like beautiful and rich land was reduced to a state of after penury by the hungry colonizers. What Marquez underlines is that co-existence, love and trust were the main themes of life in the pre-colonial era. The killing instinct of the colonizer was something entirely unknown to the natives. His words are a simple challenge to the Darwinian Law of the survival of the fittest. Marquez lives in what he calls 'our reality' in the pre-colonial period. His lecture straightaway begins with 'fountains of eternal youth', unfathomed mysteries' and hens with tiny lumps of gold. In this historical lecture, we can describe lecture Marquez's journey as from pain to pain, from loss to loss. In fact, Marquez has assumed that whole lot of exploitative colonial history. He does not go about explaining the with colonial onslaught cud justifying his stand. He begins with implied statements of loss, injustice and pain that Latin America suffered. The next paragraph of the speech colorfully describes the brutality a madness of the rulers of Latin America in the post-colonial period. Once the natural order is ruined by colonizers, becomes impossible for natives to free themselves from all complexes and corrupting influences. Politicians and military rule have ruled this land without understanding its spirit and soul. They have acted according to their whims and eccentricities. 'I dare to think that it is this out sized reality, and not just its literary expression, that has deserved the attention of the Swedish Academy of letters. A reality not of paper, but one that lives within us and determines each instant of our countless daily death, and that nourishes a source of insatiable creativity, full of sorrow and beauty, of which this roving and nostalgic Colombian is but one cipher more, singled out by fortune'. We just cannot miss the sheer beauty of the worlds, the force and depth of expression and the genuineness of the sentiment Marquez points out the vacuum in which Latin Americans live. That is the reason why the title of the lecture is 'The Solitude of Latin America.' The rich, mysterious, occult and unfathomable past o one hand and utter penury, lack of self-respect and state of disfigured mentality today-these two poles put the Latin Americans in tongue less Solitude and loneliness. They are in a bewildered state. After being repeatedly looted years after years, they do not know where they stand or what they should say. This is a pathetic state indeed. Marquez urges the European world to 'reconsider their ways of seeing us.' Every nation has its own agenda or should have its own priorities and also techniques of achieving its desired aims. Marquez uses beautiful phrase 'solidarity with our dreams.' One's dreams are one's own every nation should stand by its own dreams. Marquez goes on to drive home the cruelly of colonization and an unjust world-order. He forcibly highlights the solitude of Latin Americans. They are a people who tongue has frozen. The unjust world-order has bereft them of establishing their own goals and means of achieving those goals. In today's world, no nation can survive without being at the mercy of the powerful nations. This is a very powerful lecture by Marquez which shakes our faith in basic tenets of modern civilization. Each word spoken by the author demand repeated pondering. How democratic is our democracy? Perhaps the process of so called growth has not been all-inclusive and assimilative. The aspirations of the marginalized cultures do not find any expression in the mainstream consciousness of today. If we want to live in a happy peaceful and secure world, we will have to listen to all societies of the world, the current world-order is unjust and lop-sided. It needs to be changed. Hierarchal thinking needs to be changed. Sectarian attitude needs to be changed. The very concept of a civilized and cultured society must change. Note: All the quoted lines have been taken from Nobel Lecture by Gabriel Garcia Marquez, 1982 Nobel Lectures, Literature 1981-1990, Editor- in-charge Tore Frangsmyr, Editor Sture Allen, World Scientific Publishing Co, Singapore, 1993.